Product prices and availability are accurate as of 2019-04-21 19:58:09 UTC and are subject to change. Any price and availability information displayed on http://www.amazon.com/ at the time of purchase will apply to the purchase of this product. DEVICO portable travel cutlery set is made of high quality food grade stainless steel, no harm to human body. Durable and healthy for everyday use, Dishwasher Safe. Simple appearance with no redundant annoying decoration, Classic design to fit any style kitchen tableware. Multipurpose use for whether you're traipsing around a city, hiking in the mountains, enjoying a picnic in the local park or on your lunch break at work, you can rely on these top-quality utensils wherever and whenever it's time to eat or drink. 1.Please wash the silverware set before first use to make sure no manufacture residue. 2.Please clean the silverware set after using and dry the pieces for their durability. 3.Please do not se iron wire to scratch the pieces to keep their smooth surface. 4.The silverware set is Dishwasher Safe so you can run it in dishwasher to save your labor. Your satisfaction is our highest priority, if you have any questions, please feel free to contact us. DEVICO offers a lifetime warranty and a 60-days refund or replacement. Health and environmental protection: DEVICO portable travel cutlery set is made of high quality food grade stainless steel. Forget the flimsy, plastic cutlery when eating on the go. Mirror finished surface and ergonomic shape, reusable and durable for daily use. Easy to clean, dishwasher safe. 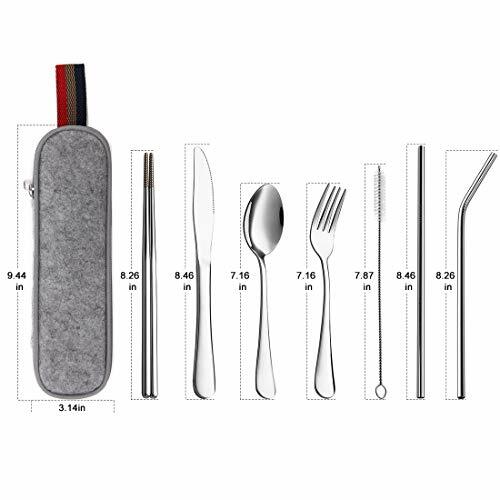 The 8-piece portable silverware set includes: dinner knife, dinner fork, dinner spoon, chopsticks, straw cleaning brush, straight straw, bent straw, carrying case. Suitable for travel, camp, school or workplace. Classic design: 8 pieces of Silverware set with a simple appearance, smooth edges without rough spots, anti-oxidation, stylish and generous. The cutlery set can be paired with any style of kitchen to meet the basic dining requirements of everyone. Carry it with you: The modern stainless steel flatware set is small in size and light in weight, making it easy to carry around. The 8-piece portable Silverware set in a carrying case with upgraded robust zipper is a must-have for daily use, camping outdoor cooking, hiking, picnic, home travel and eating on the go. Worry-free guarantee: Your satisfaction is our highest priority, if you have any questions, please feel free to contact us. DEVICO offers a lifetime warranty and a 60-days refund or replacement.